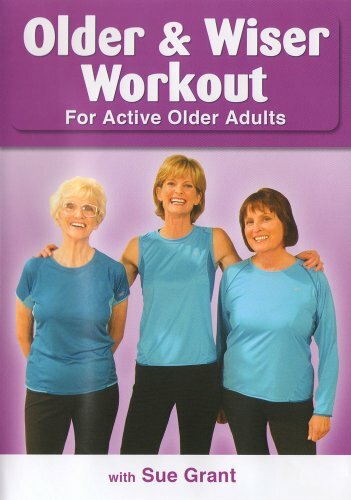 The Older and Wiser Workout with Sue Grant is a gentle, safe workout that is ideal for newbies or those who have not been working out regularly. All the workouts are done either standing or sitting on a chair with no resting on the flooring. This fun, well rounded workout includes the 3 crucial elements of physical fitness: easy-to-follow low impact aerobics (23 minutes), mild stretch training (21 minutes) and unwinding cool off & stretch (10 minutes). You might mix and match these different areas depending upon just how much time you have and how you are feeling every day. In addition, you will see 3 different levels for each exercise, so you will be able to" personalize" this workout to satisfy your specific needs. You'll love the upbeat motivation and valuable hints, and you will be astonished at how quickly you advance! Devices needed: tough chair with no arms, 2-5 pound. hand weights for strength training, a small pillow (optional). Sue Grant, accredited Master Trainer for FallProof, a worldwide acknowledged Balance and Movement training program is also accredited by the American Council on Exercise and the Arthritis Structure. Sue holds an Expert Certificate in Fitness Guideline and Exercise Science from UC San Diego, concentrating on both Personal Training and Group Fitness Guideline. She is a certified Older Grownup Fitness Professional.